Welcome to the Web site of Derek Penwell, a semi-intelligent and marginally talented biped, who occasionally manages to find something interesting to say. Derek writes stuff, making this an author's site. 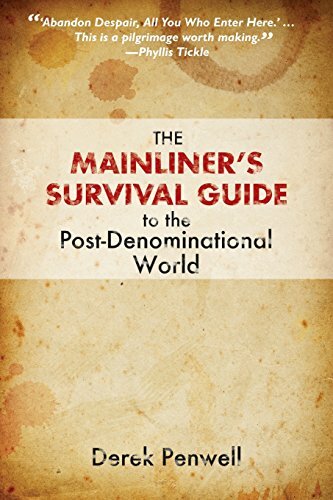 And since you brought it up, Derek has a book coming out in 2014, The Mainliner's Guide to the Post-Denominational World. It's a book that offers the paradoxical answer to the question about whether the Protestant Mainline is dying: Yes. So, the only thing left to do is to quit trying to hang on. Derek writes other stuff, like his blog here, and the blog he edits at [D]mergent.org, or over at the Huffington Post, where he pontificates wildly and presumptuously on what declining churches should quit doing. He also unashamedly offers his full-throated support for the inclusion of LGBTIQ people (delivered, of course, self-righteously and in theatrically high dudgeon). In addition to which, generally speaking, (and usually unprompted) he pops off . . . trying to keep the fires hot under the pedicured feet of the empty suits who too often run roughshod over the prostrate bodies of those on the margins. Derek is, in short, an insufferable and obnoxious lout (although, strangely enough, his wife thinks he's sort of sweet). Yeah, he's that guy, the one whom some see hovering over the salsa bowl of the literary fiesta and quickly find an excuse to check whether there's any PBR left in the beer cooler out back on the patio. Flippancy and sarcasm is his métier. Constructing straw people (? ), however, is merely an avocation. He teaches Religious Studies and Humanities at the University of Louisville and Theology at Bellarmine University, holding out hope that knowledge of another reduces fear of the other. Derek has a Master of Arts in religion from Emmanuel School of Religion, a Master of Divinity and a Doctor of Ministry from Lexington Theological Seminary, and a Ph.D. in Humanities from the University of Louisville—which we can all agree is just overkill. In his free time Derek frequently crochets authentic Mexican serapes from the tattered remnants of repurposed 1970s tube socks. Most of all, he's a husband and a dad, trying to do right by his family.